The roses in my garden are gorgeous, but they come quickly and bloom so rapidly. I can’t keep up. I hate to see them go to waste and love to extend their fragrant lives a little further. 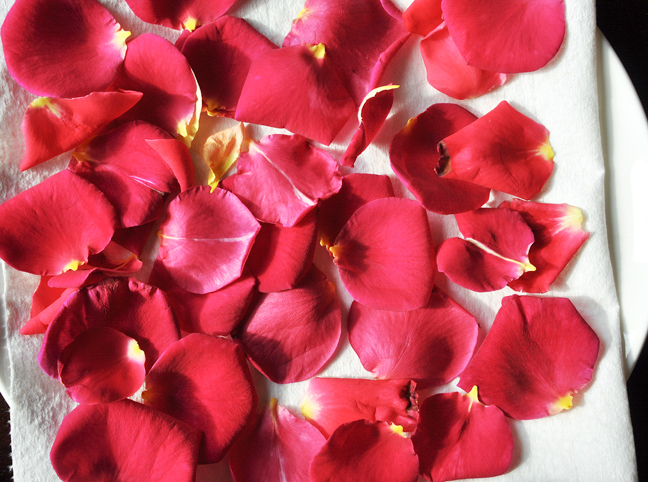 My favorite way to keep them around for an extended period of time is to dry rose petals. 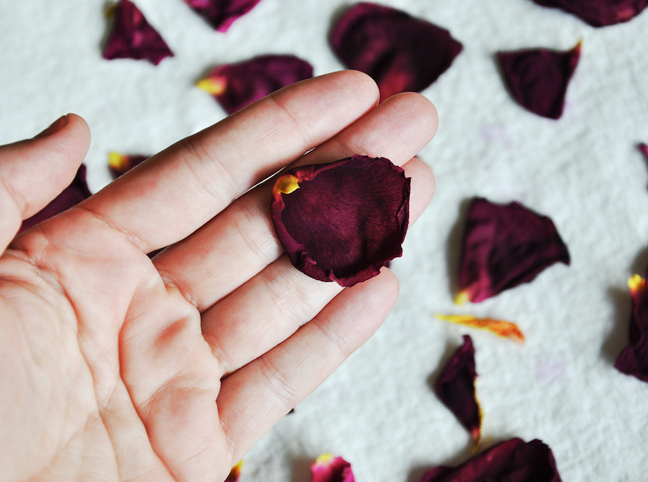 I like to keep dried rose petals in a bowl on my bathroom counter and use them for various crafts around the house. 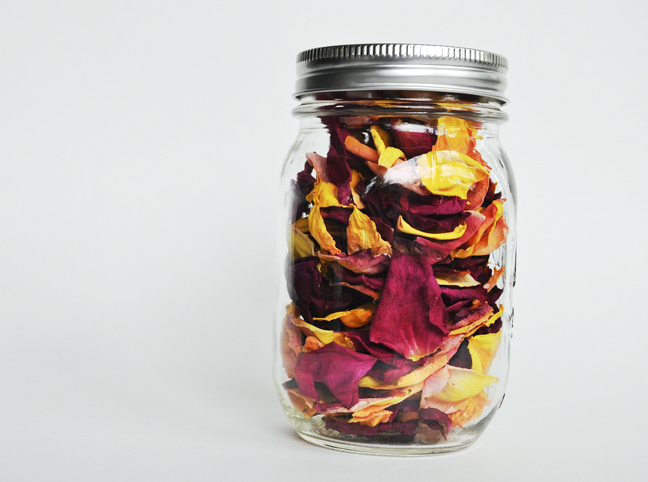 Dried rose petals make a gorgeous natural potpourri, and I’ve even jarred them up to give away as gifts. 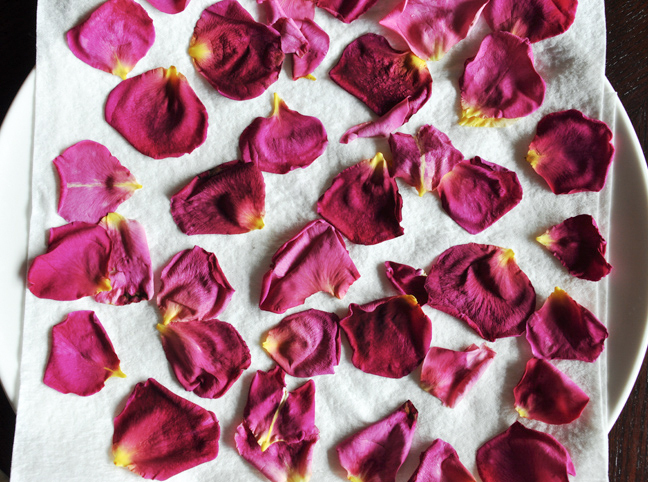 I also love the rich colors that are achieved with drying rose petals, and it’s crazy-easy: You can dry them in the microwave. 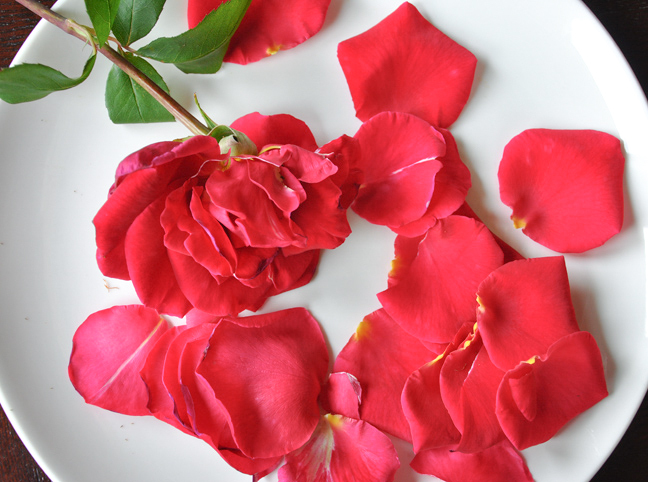 If you have roses in your garden or a bouquet of roses that you want to keep around for longer, here is how to dry rose petals the right way. 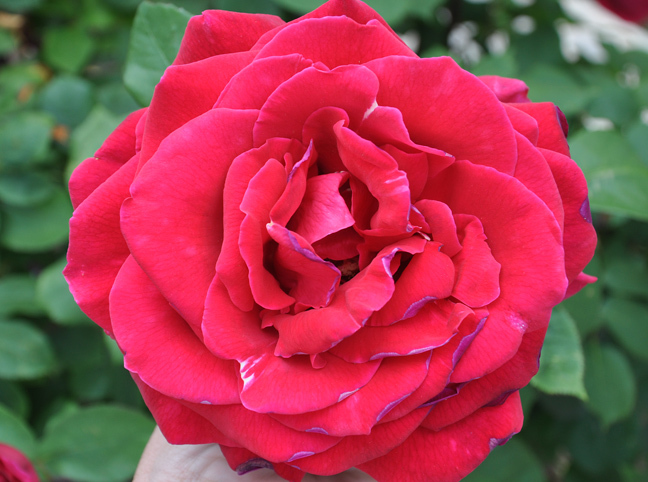 Step 1: Start by using mature roses in full bloom. Cut them off the bush just as you would for a bouquet. Step 2: Carefully pull the petals off right at the base of the stem. 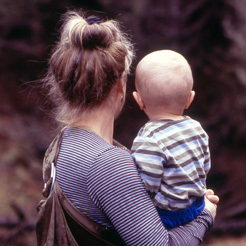 Discard the stem and leaves. 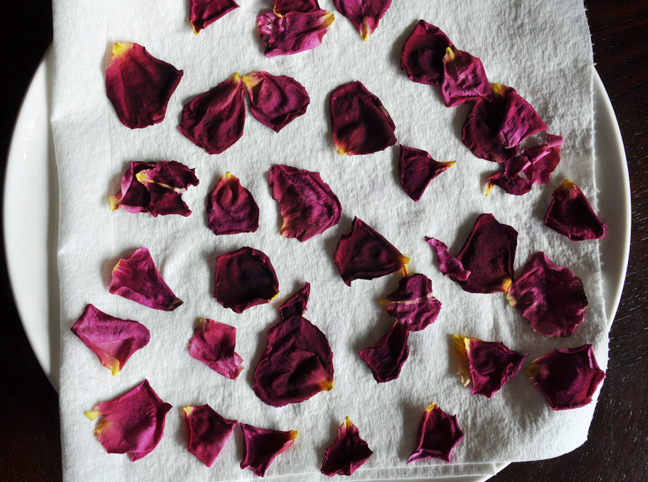 Step 3: Place the petals in a single layer on a paper towel–lined plate. Microwave on HIGH for sixty seconds. Step 4: Here’s what they looked like after a minute. There was still quite a bit of moisture in the petals. Microwave on HIGH for an additional sixty seconds. Step 5: Getting there! The larger petals needed a bit more nuking, so I microwaved them on HIGH for another thirty seconds. Step 6: The petals are done when they are hardened and no moisture is left. 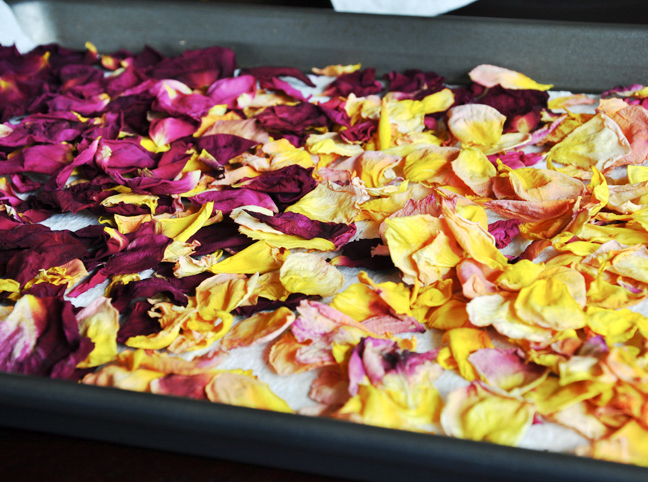 Step 7: Allow the petals to dry an additional twenty-four to forty-eight hours on a cookie sheet. Step 8: Store in a covered jar until ready to use.